I recently got around to upgrading my copies of Bone 1 & 2 and Telltale Texas Hold'em to 2.0. 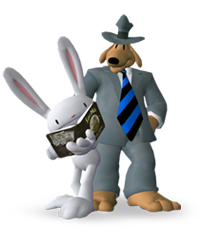 Amidst the Sam & Max frenzy, it's awesome that you guys took the time to update your older games with the most recent version of the Telltale Tool. What I'm wondering, though, is why Telltale Texas Hold'em (2.0) is your only game not to scale resolutions. It should be able to support it, given that it's running on the updated engine, much like Bone 1 & 2 (2.0) are. Anyway, that's really my only gripe. Everything else about the new versions is great. I'm not sure what to make of the new Bone 1 intro, but I'm sure that'll make more sense when Bone 3 is released. Keep up the great work, Telltale.